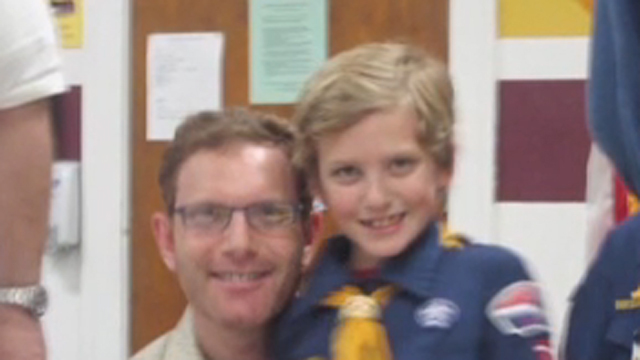 Should gay dad be Boy Scout leader? Langbert says such an arrangement is "separate but equal"
(CNN) -- The father of a 9-year-old Cub Scout said Tuesday he has been forced out of a leadership role with the organization and ordered not to wear its uniform because of his sexual orientation. Jon Langbert of Dallas, Texas, who is openly gay, told HLN's "Prime News" that he had been wearing the shirt the Scouts gave him last year with pride. The shirt identified him as a member of the leadership team that was selling popcorn for a Scout fundraiser. But that all changed last week. "Everything was running along smoothly until some of the dads complained," he said. When the complaints rose to a higher level of the Scout leadership, he was asked to stop wearing the shirt and give up his leadership role, he said. "It made me feel terrible to think about the devastating effect it would have on my son, to see his father stripped of his leadership role," Langbert told CNN affiliate WFAA-TV in Dallas-Fort Worth. "It brought tears to my eyes." A Scout Circle Ten Council official said Langbert was never registered as a leader in the first place. "We do have a policy that avowed gays and atheists are not allowed to be a registered leader or member of Boy Scouts of America," said Pat Currie, Scout executive with the Circle Ten Council. "It's a longstanding policy." In a telephone interview, Boy Scouts of America director of public relations Deron Smith told CNN that the discussion has no place in Scouting. "We focus on our mission, and our mission is to take young people and prepare them for an exceptional adulthood," he said. "That's it. That's why our policy is the way it is. Our volunteer leadership has elected to keep that policy in place." Smith said Langbert is welcome to continue volunteering his time, though not as a leader. "The policy, as it is written, is that the Boy Scouts does not accept for membership avowed homosexuals," he said, adding that the issue would not have arisen had Langbert kept his sexual orientation private, since prospective leaders are not asked whether they are gay. "This is not meant as a social commentary," Smith said. "We do not have an agenda that we're pushing. We don't discuss this with our kids. We're simply an organization that feels like this is the right thing for our membership and we move it forward and we simply focus on our mission. It's really that simple." But Langbert said continuing in a nonleadership role is not acceptable to him. "It's separate but equal -- I can be a second-class citizen." The legality of the issue was decided in 2000 in a 5-4 Supreme Court decision by then-Chief Justice William Rehnquist, which said that private organizations like the Boy Scouts can set their own membership standards. Smith described the scouts as a nonpolitical group, noting that the president of the United States serves as the organization's honorary president. "That's regardless of what party he stands for," Smith said, adding, "He or she, I should say." But the policy shows that the Boy Scouts need to update their rules, Langbert told WFAA. "We have a black president, an Indian-American governor in Louisiana, and a lesbian mayor in Houston," he said. "This policy is out of touch, and it's time for a change." The father of triplets said he supports other rules in place to protect the Scouts -- such as mandatory safety training and a rule that requires at least two adults be present any time a boy is involved in a Scouting activity. "That's great," he said. But "blatantly discriminating against a group that happens to be gay is crazy," he added. Langbert told HLN that his son was planning to leave the Scouts. "He's saying he's not interested in continuing while his dad's being singled out like this."